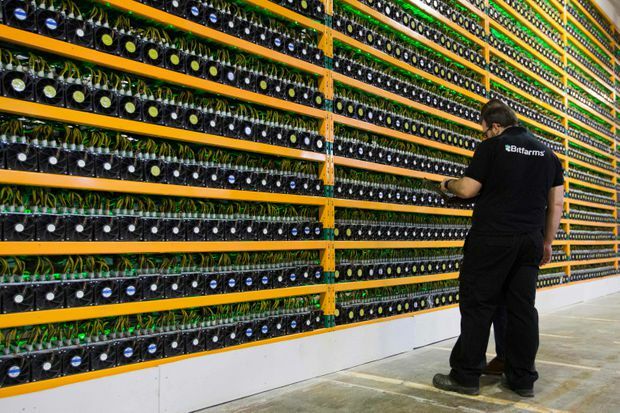 In this file photo taken on March 19, 2018, technicians inspect bitcoin mining at Bitfarms in Saint Hyacinthe, Que. Quebec will make electricity prohibitively expensive for cryptocurrency miners until it figures out how to deal with a surge in demand from the energy-hungry industry. Provincial regulator Regie de l’energie authorized utility Hydro-Quebec to charge 15 cents per kilowatt hour to blockchain companies, about three times the price they have enjoyed up to now. The temporary pricing doesn’t apply to existing clients and their operations, which total about 120 megawatts. After courting miners in recent months in a bid to soak up surplus energy from dams north of the province, Hydro-Quebec found itself flooded with requests that it says exceed its short- and medium-term capacity. The province, which offers the lowest power rates in North America, wants to set a specific rate for the industry while considering issues such as peak winter demand. Canada’s largest utility is about to file an application to the regulator proposing a selection process for the blockchain industry, to which it will allocate 500 megawatts. The selection process will enable Hydro-Quebec to survey the industry on what it considers a fair price and to gauge what investment and jobs the applicants will generate, according to Mr. Cote. The temporary price is expected to be in place for several weeks until the regulator sets a tariff that will then be applicable to all.